Have you ever shown brilliance and extraordinary talent and yet less talented peers passed you in the long run? In any endeavor, sports, dating, work and even tinkering in a hobby with the hopes of accomplishing anything, there is nothing more important than mastering basics and fundamentals. Undoubtedly, you’ve heard this before, but do you really know what this means – especially in the context of ADD and ADHD? You can have incredible talent mixed with ADHD risk taking and impulsivity and you can do absolutely amazing things which blow the minds of any spectators, but at the end of the day, most times you will fall short of your desired outcome, you will lose! You will fall flat on your face. And, it will hurt! Sorry, I know that is painful to read, but you and me, we know it’s true. Don’t we? It’s confusing, it is frustrating and it is part of having ADHD! And, you can do something about it! You may have all the talent in the world, able to do fantastical things others can only dream of, but for some strange and absolutely odd reason, others with not even half of your talent will eventually pass you in actual accomplishments. Yes, your talent is still above and beyond theirs and yes, you can still show sparks of greatness, but ultimately you cannot sustain any type of consistency whereas the person with less talent, who has mastered the basics and fundamentals, can. Someone with half the talent, or even less, but has mastered the basics and fundamentals will typically win the race. 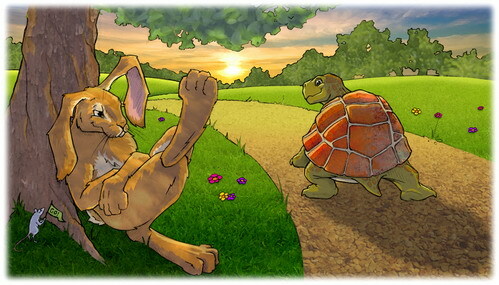 Tortoise will out-race Hare time and time again. But what about successful people with ADHD? You might ask. Think about them for a moment. What do most successful people with ADHD have that has enabled them to somehow break the mold? Too often certain boring details are skipped over when discussing highly successful people with ADHD and such omissions are NOT helpful. The rest of the story of what enabled them to become successful, despite the odds, with regard to having ADHD, would be helpful and help people like you and me, to stop beating ourselves up for not being more. Take Michael Phelps for example, he has been in training since childhood! Since youth, Michael has been coached, mentored and trained as an elite athlete. Even with ADHD, he knows and understands the basics and fundamentals of swimming better than most. Have you been in intensive training since childhood? Have you been mentored and coached to be a world champion since childhood? I know I wasn’t, and I don’t think there are a whole lot of us that have been. Trying to relate to Michael is nearly impossible for most of us. I am very happy for Michael, but this post is for the rest of us! People with ADHD receiving proper treatment for their ADHD have far and away better chances than those untreated. However, if one has been diagnosed late in life, proper treatment might still seem like it is falling short, that something is still missing. Treatment, of any kind, without the knowledge of what has been missed, isn’t usually enough. I think this gives fresh meaning to ‘going back to the drawing board’. Typically, without proper treatment of ADHD, learning basics and fundamentals is excruciatingly boring for us ADDers! We will want to skip ahead, bounce around, go back and forth and just about anything else. It’s nearly impossible to endure learning the basics and fundamentals without some type of intervention for people with ADHD. Without the best coaching, mentoring and training – do you believe Michael Phelps could have done it? I am a pool player. When I first started playing I showed an abundance of talent, I had few peers as talented as I was. However, as the years passed, playing pool became frustrating, even irritating, and people I knew who clearly didn’t have my talents or abilities crept up, year after year they continued to improve and achieved better results in tournaments than I did. I was stuck and for the life of me, I couldn’t figure out why. Because my desire for playing pool and winning was so strong, I eventually did, with help, learn the basics and from then on I began to advance. My ADHD traits became an advantage in my game, such as with hyper focusing. I think, (because this post is just my opinion) one of the major frustrations for many of us late diagnosed adult ADDers, is that even with treatment many of us are not accomplishing our goals and fulfilling our heart’s desires. Proper treatment and management of ADHD is a must, but if we still do not realize, or it hasn’t been pointed out to us, that we have skipped the most important ingredients of success, such as learning basics and fundamentals, we are still going to be stuck and perhaps think treatment isn’t working. The good news is that with proper treatment and management of ADHD, going back to learn the basics and fundamentals of whatever it is you do, isn’t going to be as boring as it once may have been. Most of us skip the basics and fundamentals not because we think we can do without (Well, yeah, that’s part of it when talent shines too brightly – ohhh shiny, anyone? ), it’s because those tedious little details are boring as heck! The decades will roll by and things will not improve in specific endeavors if the basics and fundamentals are not learned. You can have the most advanced and perfectly conditioned race car in the world, but if it doesn’t have the right tires, it’s not going to make it to the finish line! This has been a long post, but if you made it this far, maybe you can relate? If you have ever tried and tried again and again, even with diagnosis and treatment, but still could not maintain – perhaps consider the basics and fundamentals of your endeavors. If you have already: did it make a difference? I’d like to know. Have you ever show brilliance and extraordinary talent and yet less talented peers passed you in the long run? You know, I think it is interesting how negative I was towards myself due to being so inconsistent in pool. One day hot, the next day not, sometimes it would go hour by hour. I would get so frustrated and outright mad at myself, telling myself such devastating things to try and pick my game back up, but isn’t it funny (not really), that just by learning to stand correctly, hold the cue a certain way, which is the most basic of the things I needed to do – you know, the boring stuff, helped bring my consistency up to a level that I had never imagined possible. Yes, I still struggled with distraction for a long while, but when you realize there are solutions and they are real and workable solutions, it makes no sense beating ourselves up constantly, because doing that of all things will not help. It’s a matter of knowing what those solutions are. How could I know my foot was pointing too far inward in my stance? Without a mentor, learning the basics and fundamentals, it may well have stayed that way forever. Oh, it wasn’t just my foot, trust me! It is never too late to learn the basics and fundamentals! And if you are properly diagnosed with ADHD and receiving treatment, so much the better to help you focus on mastering them! Previous post: Have you ever wanted to be… better than you are?